Kohli was given a mixed reception when he came to bat after the fall of opener Mayank Agarwal with the Indians fans chanting his name, while some of Australia's fans booing the star batsman during the fourth Test in Sydney. Former Australian captain Ricky Ponting has slammed sections of the SCG crowd for booing India skipper Virat Kohli when he walked out to bat on the opening day of the fourth and final Test on Thursday. Kohli was given a mixed reception when he came to bat after the fall of opener Mayank Agarwal with the Indians fans chanting his name, while some of Australia’s fans booing the star batsman. “If it was booing then it’s absolutely disgraceful,” Ponting said on Channel 7. “I said that in the Perth Test as well. 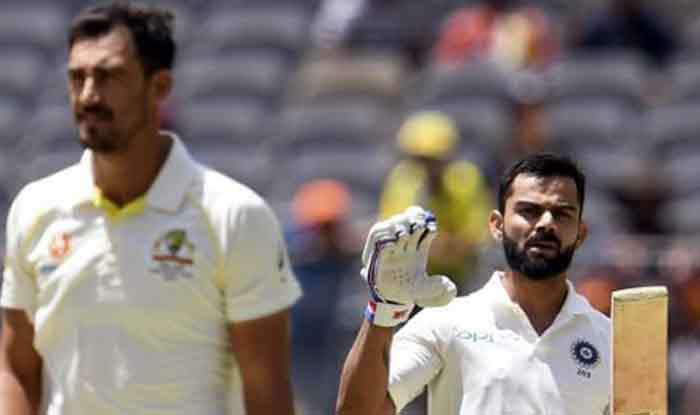 Show some respect.” Kohli has been on the receiving end of the Australian fans in all the three Tests and Ponting and Australian batsman Travis Head had expressed their disappointment. The Indian skipper is no stranger to such strong reactions as he was also jeered by fans in the 2012 Sydney Test during his maiden tour of Australia. In fact, Kohli was fined 50 percent of his match fee for showing his middle finger at the crowed after he was heckled by the fans. Cheteshwar Pujara came up with a typically gritty century as India posted 303/4 in their first innings at stumps on the opening day of the fourth cricket Test against Australia on Thursday. Pujara was batting on 130 when the umpires decided to call it a day. His 250-ball stay in the middle was studded with 16 hits to the fence. Hanuma Vihari was batting on 39 at the other end. For Australia, Josh Hazlewood was the most successful bowler with figures of 2/51. Fellow pacer Mitchell Starc and off-spinner Nathan Lyon bagged a wicket each.India are 2-1 up in the four-Test series. India received a jolt very early as pacer Josh Hazlewood drew first blood for Australia, dismissing Rahul in the very second over of the day. A good length delivery outside the off-stump got a thick outside edge from Rahul’s bat and went straight into the hands of Shaun Marsh at first slip with India’s score reading 10 runs.